Looking for tennis racket rentals and where to play tennis in Key West? See our list of public tennis courts, and where you can play free. Not just bicycle rentals - we also have tennis racket rentals and family items, such as bikes with baby seats, bikes with totes for two children, kid's bikes and more... rentals for active Key West fun! Tom Theisen, Key West Florida - call or text. With year round great weather, Key West, aka the Conch Republic, is one of the Florida Keys islands where all outdoor sports and activities are great fun. In Key West, FL of course there's boating and fishing, scuba diving and snorkeling, great art, museums, night life, great restaurants! Enjoy it all! We do our part to preserve the earth and maintain the greenest policy for our business, click if you would like to watch videos of our rental service without the use of trucks or gas, renting bikes in Key West. We also love tennis, and we provide racket rentals for men and women. The new BikeMan Blog is up... and we've got a video about the tennis rackets we rent out. Check the info here: tennis-racket-rentals-in-key-west-fl. 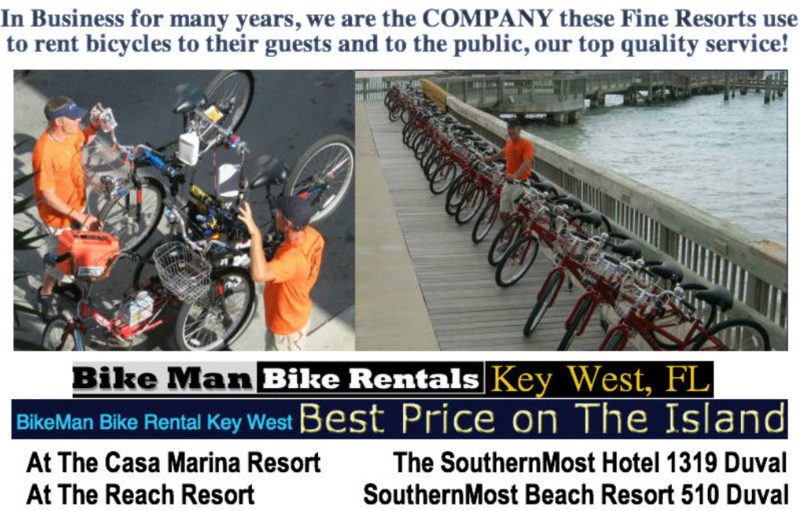 Links to get more info - Pricing for bicycle rental Our bike rental locations for cycling Key West. Tom Theisen is the bike guy in Key West, and he has a youtube channel. See video's about fixing brakes on speed bikes, how we service the bicycles rentals at the Marriott Key West, our bicycle rentals at The Casa Marina, and our other rental locations. See the portable bike hauler and our innovative workstations for changing tires and the lube machines. You Tube -Tom The Bike Man Key West. Buy the famous DING-DONG...Bike Man T-Shirts! Service and Store link: Buy used bikes in Key West. More info: biking in key west, Florida Keys USA. Post Reviews of the Key West Bike Man Rentals on Yelp.com: bike-rentals-key-west Thank you. Map for our bikes at Southernmost Hotel Collection 1319 Duval St. Key West, FL Bicycles rentals right there at the Hotel!